The CEO at the top of the best paid in the Portuguese job market compared his salary with a medium range football player. Last year, he took home €2,2m. It seems like it pays off to be a CEO. A CEO is the executive president of a company, representing in hierarchical terms the employee that assumes the highest leadership position, a position that brings along greater responsibilities and which might by the end of the month, become quite rewarding. At Lisbon’s stock market, the best-rated CEO has been António Mexia, for many years in a row. April this year he was nominated for his fifth consecutive mandate as the CEO of EDP. Over the course of 12 years running the company, EDP has accumulated profits of around €12bn, with €7bn going to the company’s shareholders. The company’s generosity towards shareholders, however, had a good return rate, as Mexia himself has accumulated a richness of around €20m during his time as EDP’s leader. 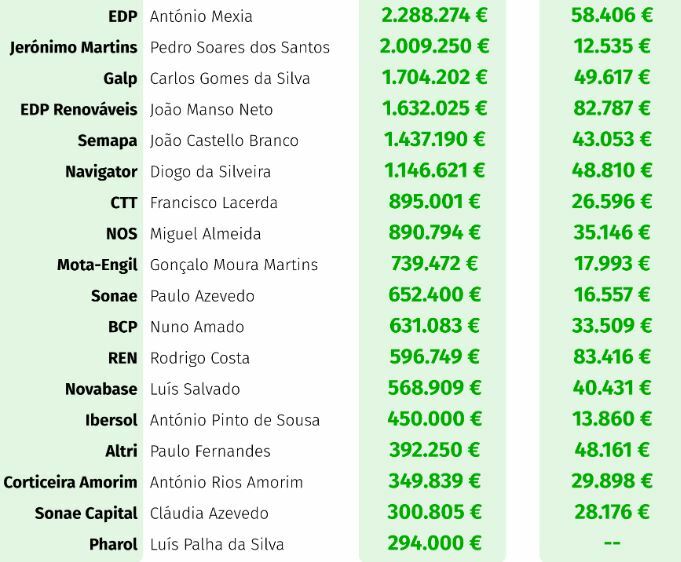 At the ranking of the highest-paid, António Mexia is followed by Pedro Soares dos Santos, Jerónimo Martins’ CEO (owner of Pingo Doce, Recheio, Biedronka and Ara) and Carlos Gomes da Silva, Galp’s CEO. The average compensation for companies’ CEOs reached the amount of 900 thousand euros per year during 2017, a sum that was 22 times higher than the average salary paid to employees. Each companies’ employees took home, on average, 39 thousand euros in 2017, which represented an increase of 3,6% in comparison to 2016. As good as a football player’s salary? How does it feel like, being one of the best-paid CEOs in the country? This is the question Sábado magazine posed to António Mexia in 2016 as the CEO took home an income of around €2,1m. The chief executive, who happens to be a football fan, answered that his salary was “the equivalent to a medium-range club, center-right football player” although, he added, he did not consider himself as a “little league player”. “When it comes to the energies sector, other CEOs in Europe or the USA who run similar companies with the same dimension as the one I’m running, get paid much better” he highlighted, referencing the profits EDP achieved that year. What about other countries? Who’s the winner? According to Bloomberg news agency, USA’s CEOs really are not even competing on the same league as others. The Bloomberg Pay Index shows that Snapchat’s CEO annual compensation reached $504m. Evan Spiegel is at the top of the ranking in the North American ranking. Right after come Scott Nuttall and Joseph Bae, both co-founders of the private equity KKR (whose revenue surpasses $200m), Elon Musk, the well-known founder and CEO of electric car company Tesla, who has become $150m richer. Next to these on the ranking, Google’s CEO Sundar Pichai shows up with a $144m annual compensation. Paulo Patrício, IoT Solutions Manager at Celfocus, talks to ECO about some of the projects in traction regarding the Internet of Things. A smart t-shirt and a smart car equipped with Wi-Fi.